Taiji: Each year as part of Dolphin Project’s Cove Monitor activities to raise awareness about dolphin captivity, I visit the Taiji Whale Museum. In November 2014, two Risso’s dolphins were captured during Taiji’s dolphin hunts – a piebald Risso’s and a white Risso’s. 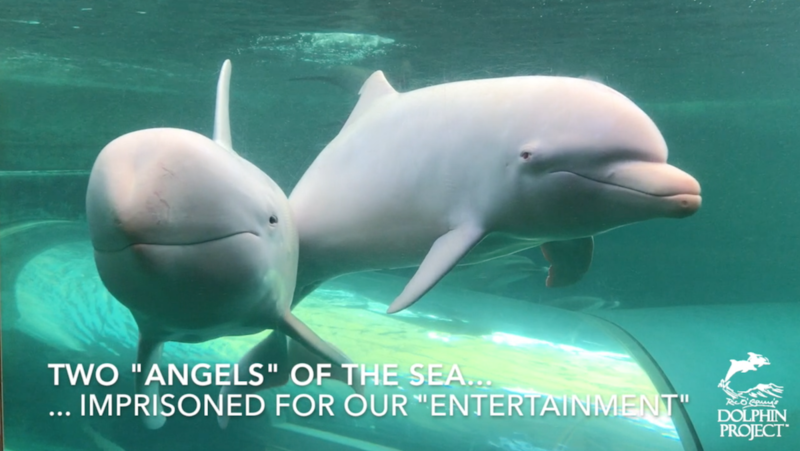 Both males were named by combining syllables from the words “hamayu” – a white flower found in Taiji and “Taiji”. The piebald was given the name, “Yuji” and the white Risso’s, “Hamata”. 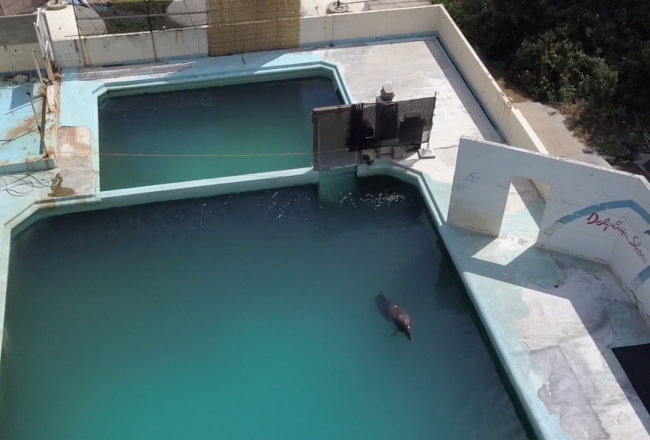 Several times since I have checked on these two dolphins, along with the other captives held at the facility. In 2017 Hamata was moved into the Marinarium – a small, fully-enclosed tank that gets no sunlight, complete with a walk-through tunnel that greatly reduces the swimming area available to the dolphins. 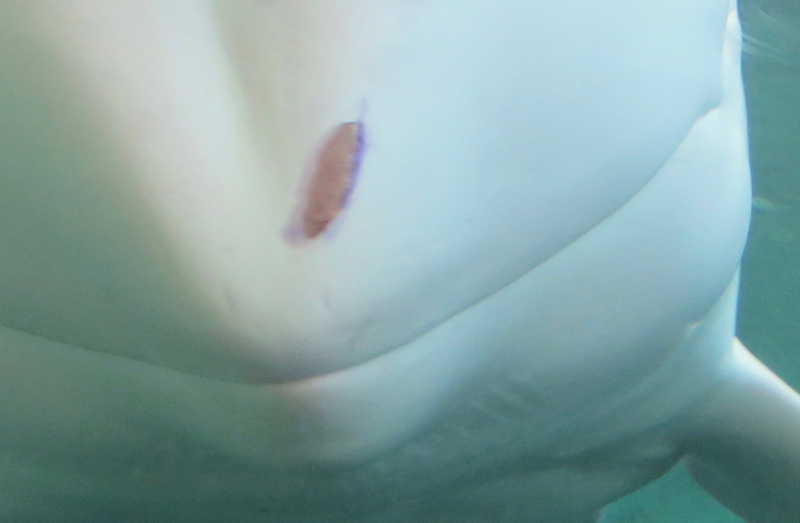 This is also the tank where Angel resides, a true albino bottlenose dolphin captured in January 2014. Today, an odd, unnatural pod forms Hamata’s “family”, consisting of three pantropical spotted dolphins, a lone striped dolphin (who is said to be the only striped dolphin in captivity) and Angel. Species that would never interact with one another in the wild were now living together in a small tank. My heart broke during every visit, as I wanted nothing more than to strap each dolphin onto my back and carry them back to the ocean to the life they deserved, swimming wild and free with their families. Of course, that would be impossible as their families were slaughtered during Taiji’s drive hunts. All I could do was look them in the eye and try to convey my apologies for the actions of my species. Hamata would always pay close attention to me and the other Cove Monitors. Often, he would chase away other dolphins who wanted the attention we would give them. And, being the largest dolphin in the tank, he got his way. He would “follow” us from window to window, while sometimes just hanging motionless as we stared at one another, our faces just inches apart. As a trained biologist, I knew I shouldn’t anthropomorphosize, but I couldn’t help but feel that somehow he understood we were the “good guys”, fighting for him and other captives. 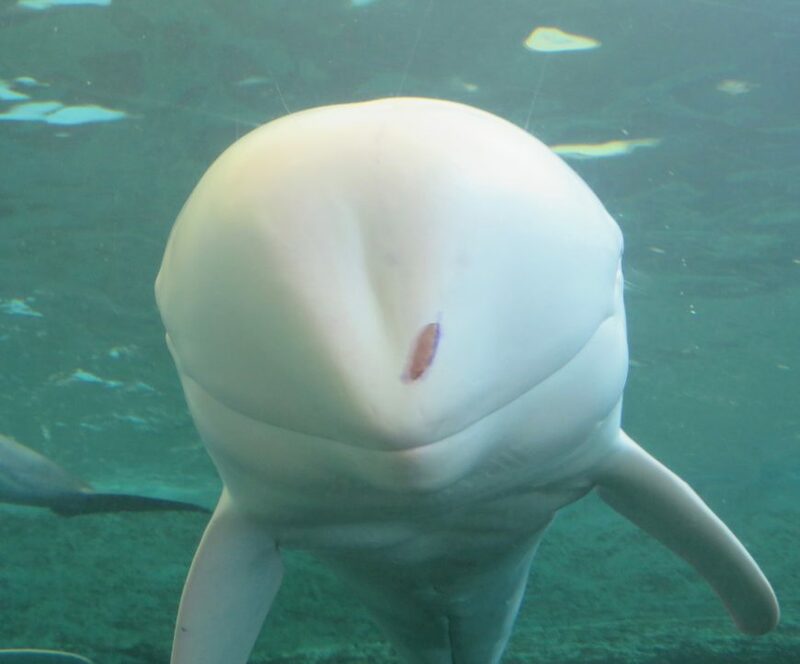 On February 24, Cove Monitors visited the Taiji Whale Museum. Nothing could have prepared us for what we saw. Hamata wasn’t his usual “interactive” self. Well, that wasn’t entirely true. He WAS interactive but this time, instead of paying attention to the humans on the other side of his enclosure, he was fixated on his tank wall. Hamata was slamming his head against the concrete, backing up, then repeating the process. We witnessed Hamata’s self-harming behavior eight times. Visible was an open sore on his forehead, with remnants of medication on it. Obviously he had done this before. As we continued to livestream, I moved to the top of the tank where there was a lot of splashing and noise. I could see Hamata chasing Angel at very high speeds, trying to breach out of the water and land on her. I had see them “play” before but this was different. This was aggressive, with Angel the target of his aggression. This went on for awhile before he seemed to tire out, switching to logging lifelessly at the surface of the tank. Ric O’Barry weighed in after watching the clip of Hamata, calling his behavior “clearly psychotic”. 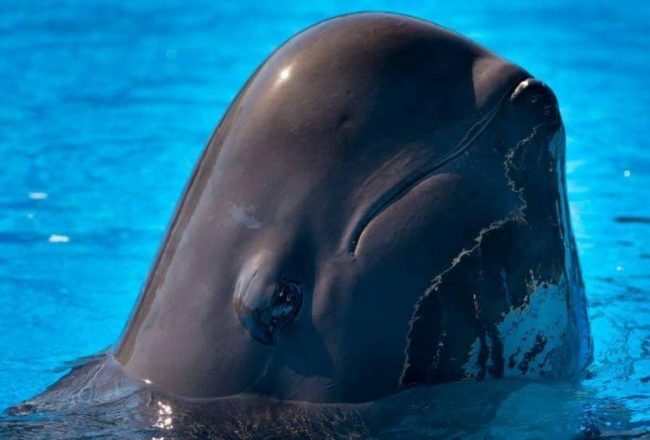 This beautiful dolphin, sentenced to “life” in captivity because of his color while the rest of his family was slaughtered was now going insane. And he’s not the first. Hugo, an orca at the Miami Seaquarium repeatedly banged his head against the concrete wall of his tank until he died of a brain aneurism. I couldn’t help but think of the contrast between Hamata and an albino Risso’s dolphin calf that was first spotted off the coast of Monterey, California in 2015. No one pursued and captured that dolphin. The only people who saw it were those who were lucky to be on a whale-watching boat on the right day, at the right time. How I wished Hamata would have been born on that side of the Pacific ocean. 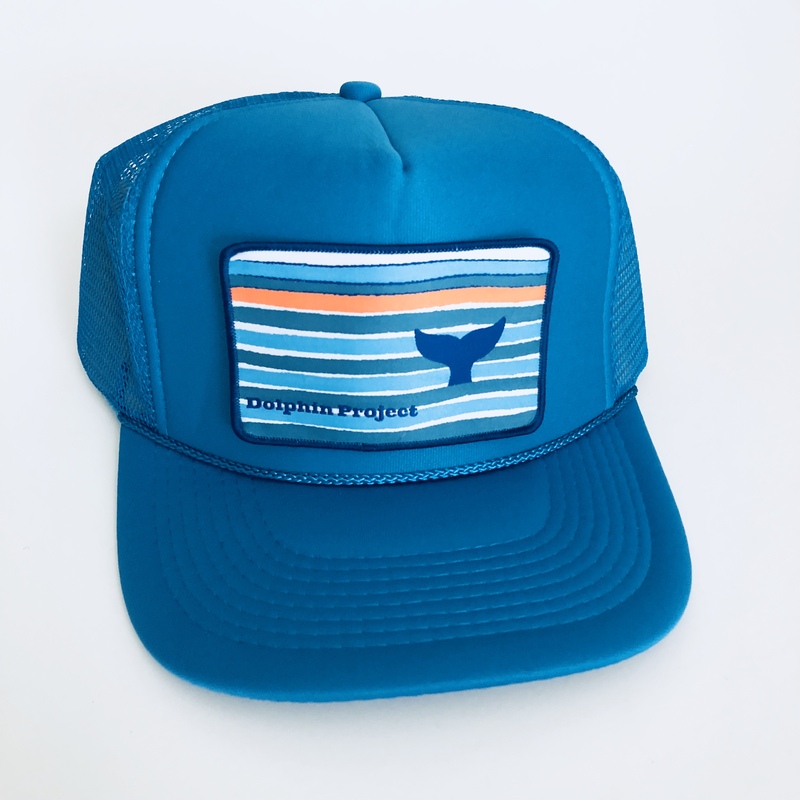 Many people who visit marine parks claim to love dolphins. Yet I have to ask: where is the respect? 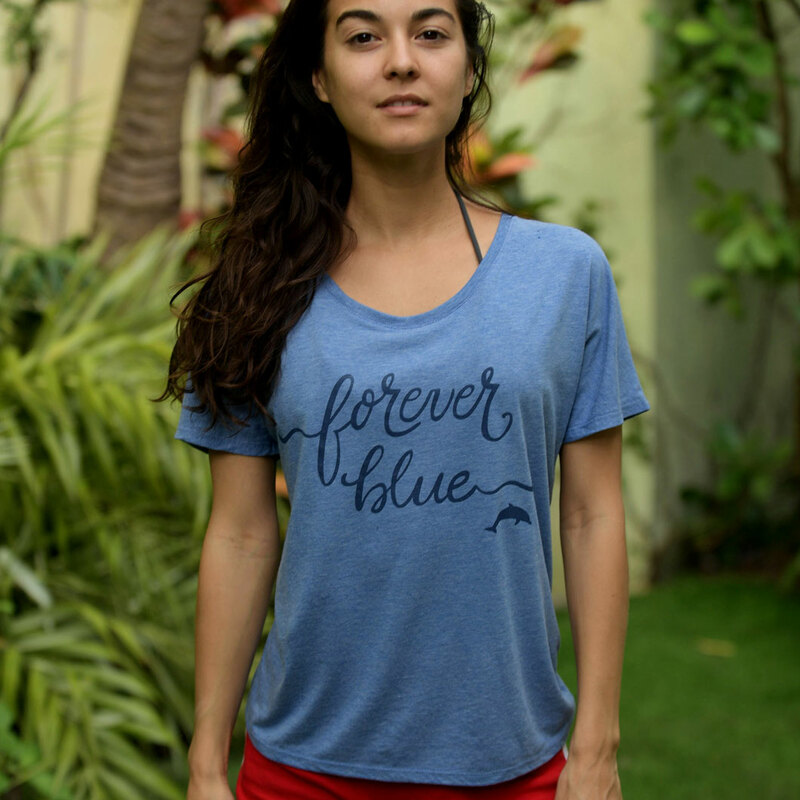 My hope is that we can teach our children to love, respect and appreciate dolphins; to watch them in the wild, on their own terms and to shun keeping something they “love” in confinement.